I was a huge fan of the original Melrose Place television series (1992 - 1999). Sometime during the shows run a fan magazine was published. I can't recall the publisher's name, or the number of issues that were published. 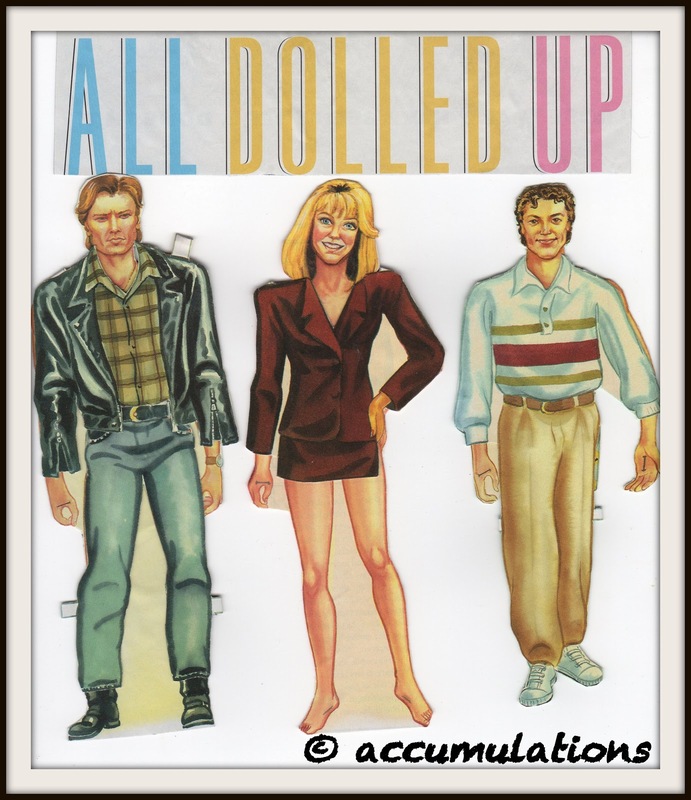 The issue I purchased included paper dolls for three of the characters: Jake Hanson, Amanda Woodward and Billy Campbell. I remember reading the magazine from cover to cover, and afterwards cutting out the dolls, clothing and character profiles. Every piece was glued to construction paper before I began cutting. I still have these paper dolls. 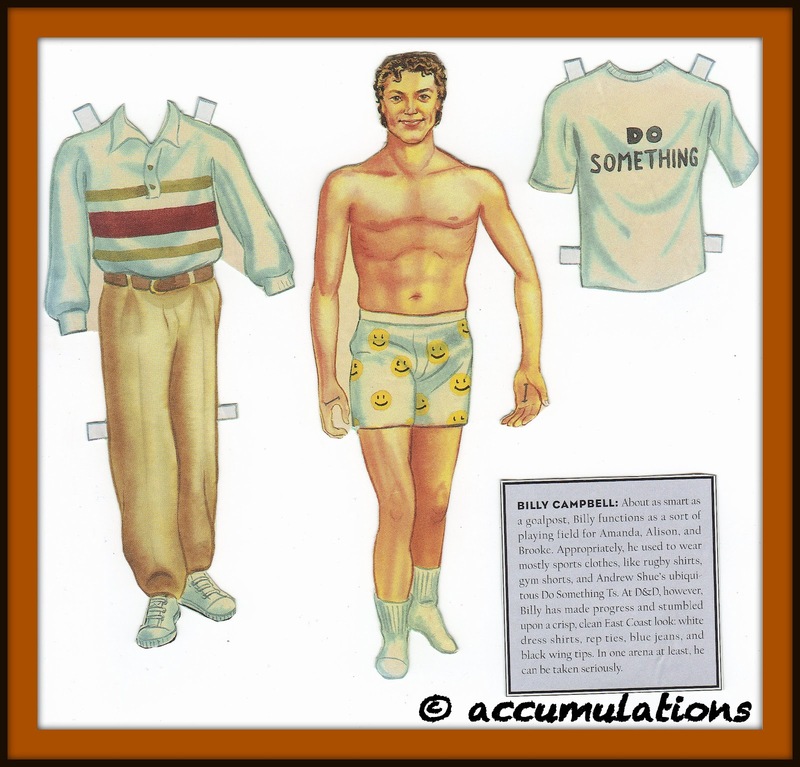 A recent discovery on Pinterest has provided me with knowledge that additional paper dolls were featured in at least one other issue. 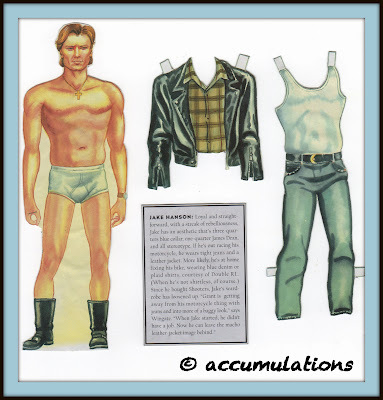 This pin is of one page from the "Special Melrose Place Issue," which includes a paper doll, outfit and profile for Sydney Andrews. The same page also features text boxes with character profiles for: Alison Parker, Jane Mancini and Jo Reynolds. The following images were compiled a few years ago. Obviously I can't (and don't) claim the copyright for the original magazine graphics and content. I scanned the images and framed them out. 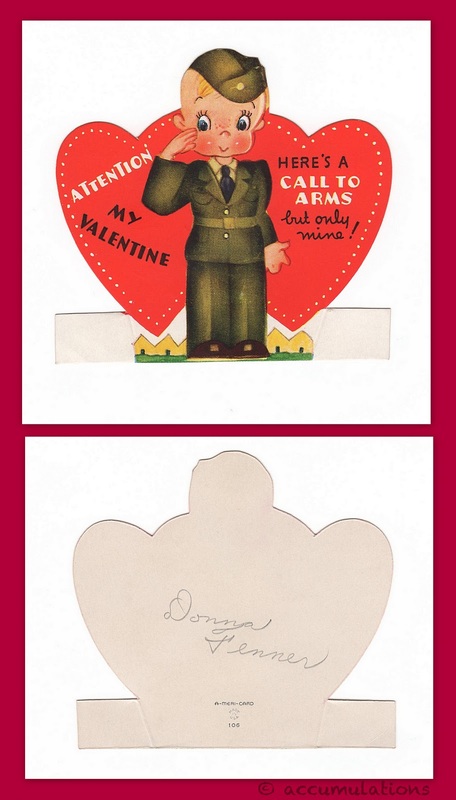 thoughts of St. Valentine's Day! Happy Monday to you! 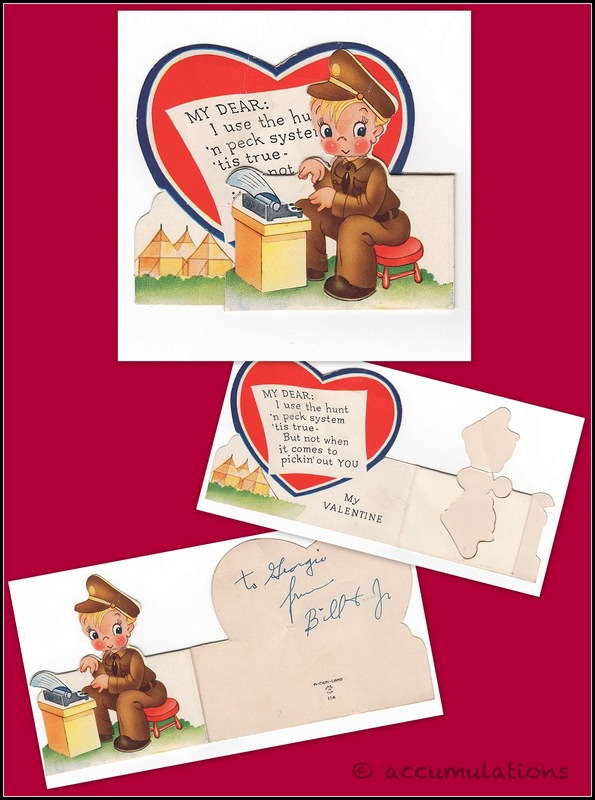 As St. Valentines Day draws near, let us take time to think of our Men and Women in the Armed Services. 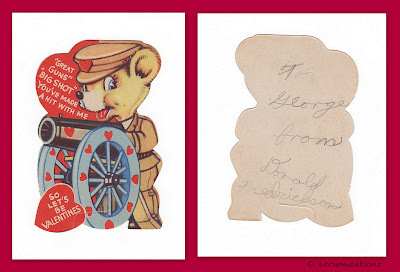 I was digging through my vintage valentine collection, and discovered that I have a handful of cards that would be ideal for our servicemen and women. I hope you enjoy them as much as I do! 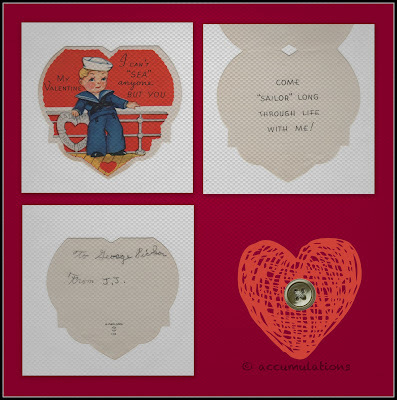 Inside: COME "SAILOR" LONG THROUGH LIFE WITH ME! Back: Signed ~ To George Pickor, From J.J.
Back: Signed ~ To Georgie, From Bill & Jr.
Front: "GREAT GUNS" "BIG SHOT"
HERE'S A CALL TO ARMS but only mine! I'M UP IN THE AIR ABOUT YOU! Here for your viewing pleasure are vintage handmade valentines. 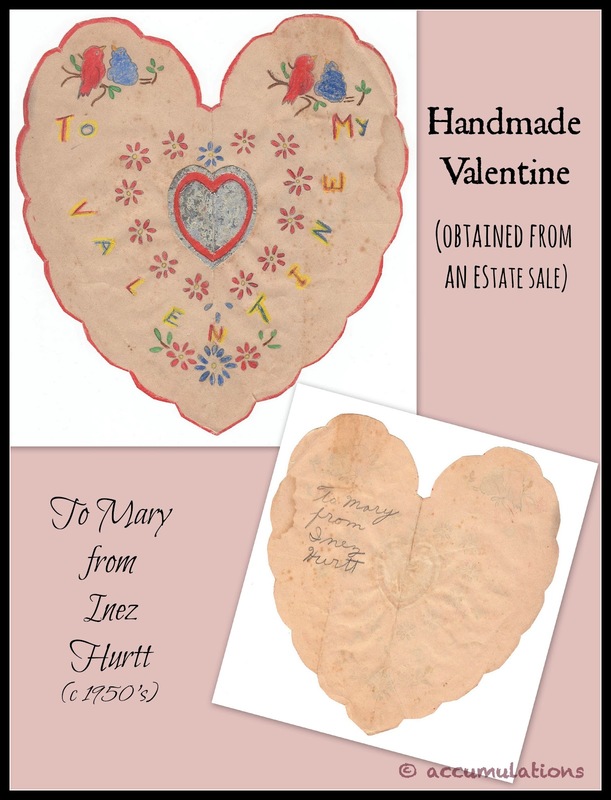 I obtained them from two separate estate sales in 2012. Outlined with a red colored pencil, and brightly colored. The flowers and birds seem to have been stenciled. 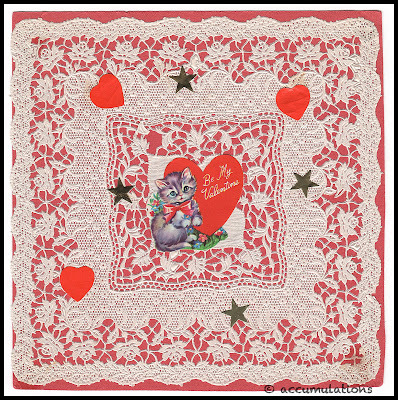 Foil was used to make the heart in the center. 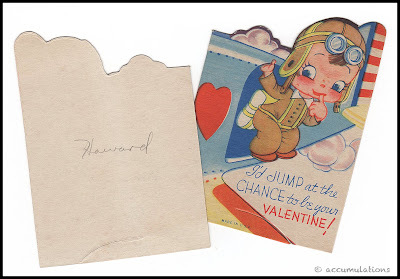 Very simplistic, yet straight to the point...Be My Valentine! 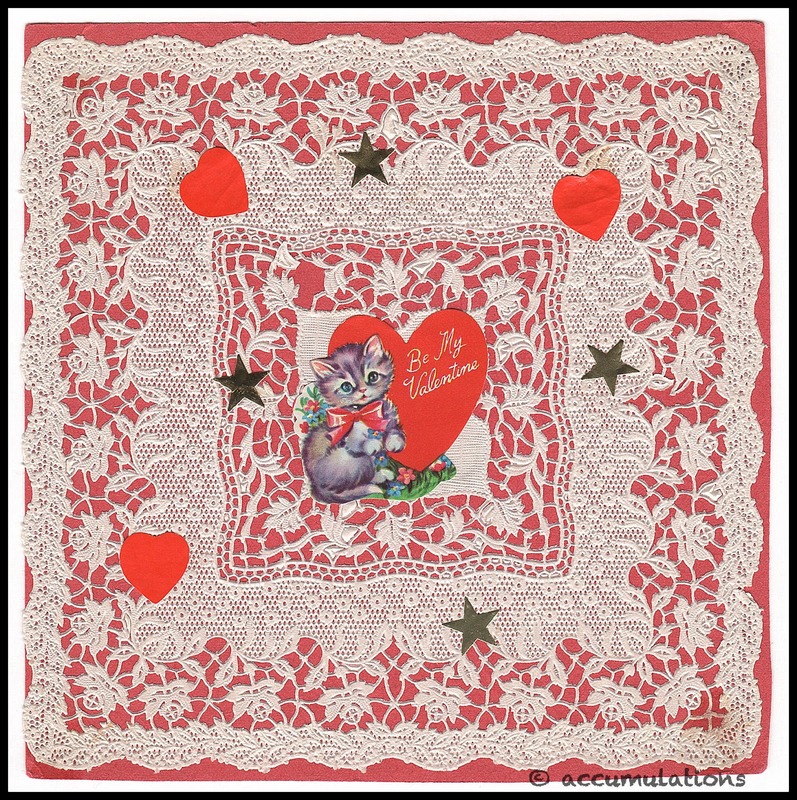 A lovely square doily affixed to red construction paper. I've linked up with A Lovely Blog Hop (Every Thursday @ lovely army wife)...Hop on over, peeps! It may sound corny, but I'm a sucker for puns! 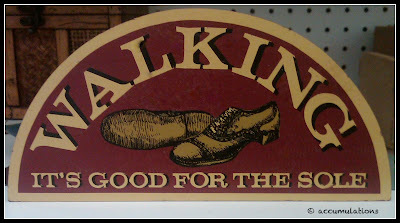 I just couldn't step away from this plaque, but after some soul-searching I decided not to foot the bill for it. I'm not much of an artist, but here is a book I've started to alter in 2011. It is a 1905 book entitled HEART THROBS: THE OLD SCRAP BOOK. contained a collection of gushy romance stories. The book contains prose and verse, which was chosen by more than 50,000 Americans, in a contest held by National Magazine 1904-1905. 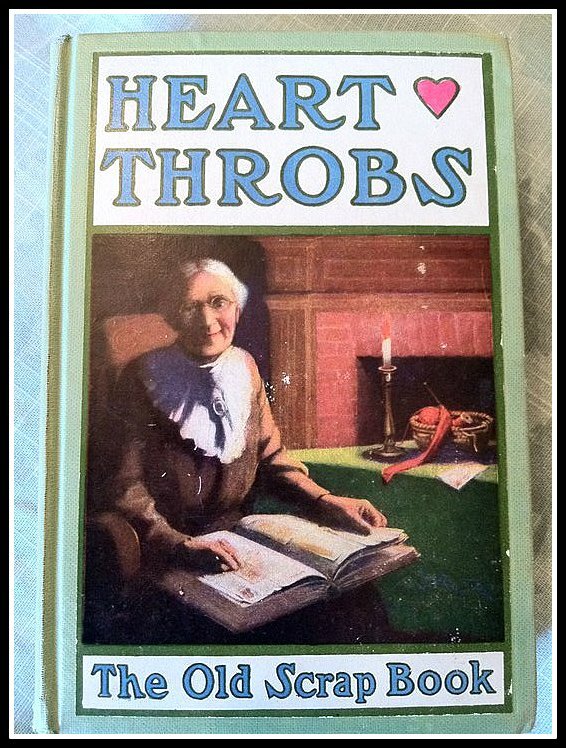 Readers were asked to contribute pieces which they considered 'real heart throbs' ~ those things that make us kin, those things that will endure. These could be clippings, a story, an anecdote, or a selection that has touched their heart. 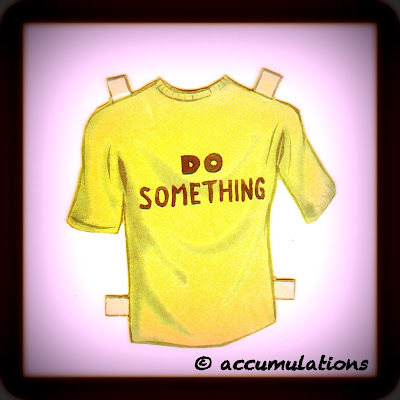 If chosen for inclusion in the book, the contributor/reader would receive one of the 840 copies of the book published. This is one of those copies. A few weeks ago while shopping at Unique Thrift Store, I happened upon these vintage Black Raggedy Ann & Andy wall plaques. 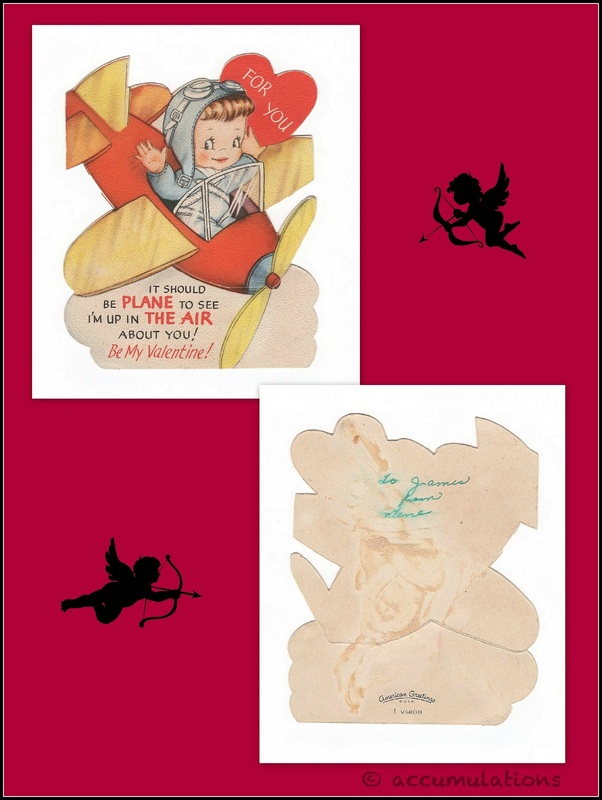 They are lithographs on pressed wood, and are by Lyn (Stapco, NY). I'm guessing they are from the 1970's. They feature the rag dolls tending to their garden...how cute! These were also made in a white (with red hair, of course) version too. 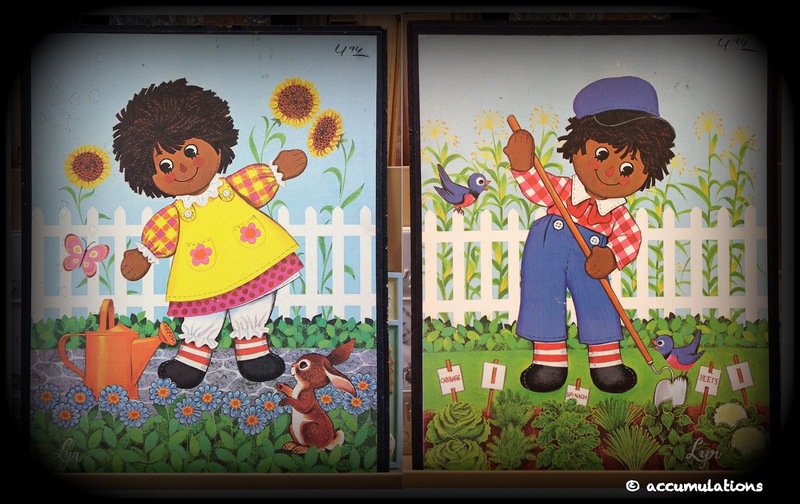 As you can tell by the photos, I could have gotten these for $4.94 each. I only had a moment to look them over, and my initial thought was to pass because they appeared to have water stains, nicks and scratches. This evening I searched online for more information, and I discovered close to a dozen listings on eBay. Funny thing is...those being offered online are not much better, condition wise. Hopefully they found a new home! 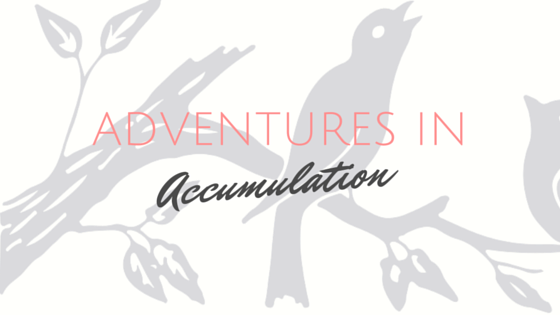 © 2015, Accumulations. All rights reserved. Simple theme. Powered by Blogger.